Cut Your Writing and Grammar Instruction Time in Half! Times sure have changed, haven’t they? It seems like just yesterday when students were worrying about losing pencils. Today they’re worrying about Wi-Fi connectivity. It seems the older I get the more I realize I need to keep up with the times and move forward as an educator. What would you do if you had more one on one time with each student? Sounds like a dream, doesn’t it? Are you searching for ways to reach that reluctant writer and meet your writing standards at the same time? If you are willing to blend technology with your traditional writer’s workshop, you can do just that! 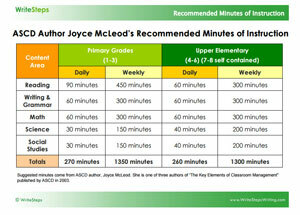 You can download a copy of Joyce McLeod’s recommended minutes of instruction here. Pictured: A teacher spends more time in personalized conferences with her students. What if I told you there is a way teachers can stop having to teach whole group writing lessons thus reducing that needed “60 minute” recommended time frame and instead spend time personalizing instruction during one-on-one writing conferences and providing the students with a meaningful chunk of time to write? It’s possible! Blended learning decreases traditional whole group instruction time by half! 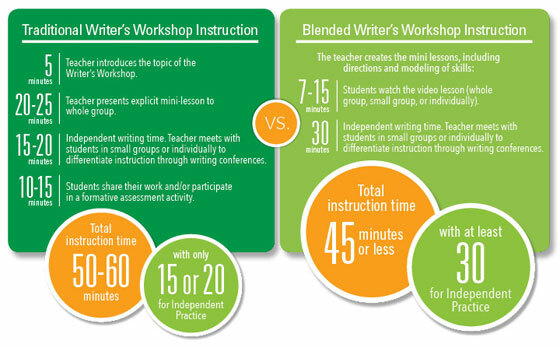 Let’s take a look at the time it takes to teach writing and grammar with traditional instruction vs. a blended approach. Right now, you might be wondering how you will find the time to create the video lessons needed to accomplish blending your writer’s workshop. You don’t have to worry because the 2015 Michigan Technology Teacher of the Year, Joanna Van Raden, did the work for you! Captivators are videos found in CaptivationStation that present the day’s instruction. They are 7 to 10 minutes long. Therefore, they reduce writing instruction time so students spend more time on independent writing practice and teachers spend more time in personalized conferences. Encouraging your teachers to use Captivators to blend their writer’s workshop can help them to teach the standards while alleviating some of the pressure they feel as they are trying to meet individual student needs. 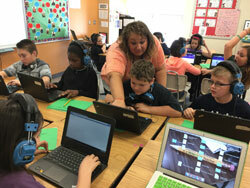 Blended learning also opens the door to the possibility of providing student authors the opportunity for peer interaction and publishing to authentic audiences. These opportunities have been virtually non-existent, until now, with the launch of CaptivationStation. CaptivationStation is a first-of-its-kind blended learning instruction and practice platform where 3rd-5th grade students acquire their standards-based writing and grammar instruction through daily Captivators videos, write digitally, and receive peer and teacher feedback. If you are unsure about incorporating technology in your classroom, now is the time to throw out those bowlines and set sail! Whether we like it or not, technology is changing the way we teach. Hari Krishna Arya said, “Teachers will not be replaced by technology, but teachers who do not use technology will be replaced by those who do.” Don’t get left in the dust! A picture, or in this case, a letter, is worth a thousand words! 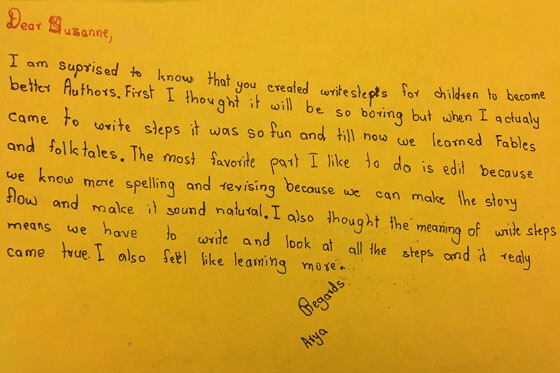 We love hearing how WriteSteps is making an impact on students. Thank you for your kind words Arya. Keep up the great work! Don’t miss Joanna Van Raden’s presentation, Blending the Writer’s Workshop, on Monday, December 12 at 11:45 a.m. during the Technology and Information Education Services Conference at the Hyatt Regency.